I have used Dabur Vatika many times before; it’s an excellent hair oil. (Read review). In addition to coconut oil as the base oil, it has several herbs in it and it nourishes the strands very well. 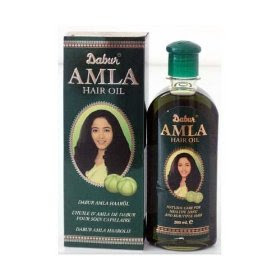 Knowing about the goodness of amla, I even tried their Amla Hair Oil. It’s a lighter shade of dark green and has an overpowering smell, which is a bit of downside. But that’s fine with me as I always massage hair oils at night and wash my hair the very next morning. It could however mess your sheets and make your pillow case to stink, so make sure you are not using brand new or expensive ones. Other than that, it’s a good product – it’s very cooling and it did impart luster and sheen to my hair. Ingredient list: Mineral oil, veg.oil (sesame oil, canola oil, peanut oil, cottonsead oil, palmolein oil, oil extract of amla (indian gooseberry), colours & perfume and antioxidant. I just got this set as a gift. I love it.. The mild soothing natural fragrance in Dabur Amla Hair Oil gives an all day garden freshness.Dabur Amla Hair Oil is a scientific blend of the purest mineral and vegetable oils. Mixed hygienically in the correct ratio these oils nurture the scalp, give hair a luxurient glossy look, keep them silky and long, and prevent hair damage from the extremities of weather, premature graying and falling of hair. When massaged into the scalp it relaxes the mind, eases out stress and promotes sleep. It also nourishes and strengthens the hair roots. For external application only.Individual hypersensitive to any of its ingredient should avoid usage.Keep it away from the reach of children. Nourishes the hair, thickening and darkening it at the same time. The water in which dried amla pieces are soaked overnight is also nourishing to hair and can be used for the last rinse while washing the hair.